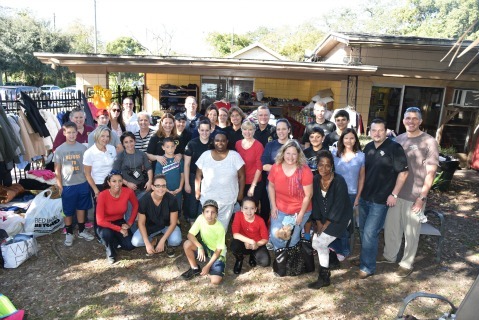 Orange County’s Crisis Intervention Team hosts Day of Giving at Pathways Drop-In Center. On December 12, members of Orange County’s Crisis Intervention Team (CIT) hosted “Day of Giving,” a holiday celebration for the patrons of Pathways Drop-In Center, which is a local organization serving homeless individuals who have mental illness. The partnership between CIT and Pathways is unique, but it’s also a natural fit. Members of CIT include law enforcement and correctional personnel who have specialized skillsets, which helps them better identify the signs of mental illness, when an individual may be in crisis and ultimately de-escalate a situation before any harm is done. The goal is to provide help when appropriate, instead of arrest or incarceration. The annual holiday event, which provides this population with an opportunity to replenish basic living essentials, also helps bridge compassion and builds a better understanding of the unique challenges these individuals face. In speaking with the patrons of Pathways, it is not uncommon to find that many hold higher degrees of education, have military service, or backgrounds that one might least expect of an individual who is homeless. For those unfamiliar with the drop-in model, Pathways does not serve as an overnight shelter. Pathways serves as a safe haven for individuals to visit during the day where they can connect with mental health services, take a break from the elements, eat or even use the internet to search for employment, other assistance, or connect with loved ones. Held annually, “Day of Giving” also serves as an opportunity for those dependent on the kindness of others to replenish basic items of necessity, including clothing, hygiene products, sleeping bags, and canned foods. While the event is organized by law enforcement and corrections, local businesses who incorporate giving back within their annual celebrations with employees, remain huge supporters. Special thanks to Physical Therapy Specialists and Matern Professional Engineering for making this year’s event a success. “Today was great. I thank all the people that donated,” says Patrica, one patron of Pathways, who couldn’t help but smile in response to the kindness she had experienced on this special day. View a video recap of the event.